We decided whilst in Seoul to take a tour of Panmunjeom Joint Secuirty Area (JSA). On our travels we try to see things that hopefully broaden our perspectives on current affairs. 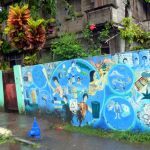 One of the most memorable and hardest hitting was our visit to Hiroshima, but we’ve also blogged about similar provoking experiences in countries like Cambodia and Vietnam. This seemed like a good opportunity to gain a bit of an insight into the history and contemporary issues affecting Koreans today. 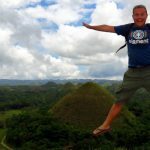 Which tour to take from South Korea? For any tour to the JSA, as a foreigner, you need to book at least three days in advance providing your passport; it’s longer for Koreans who have to give at least one month notice. 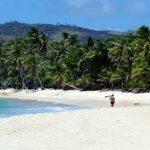 There are many companies offering this tour, and we chose one of the cheapest at US$100 each. 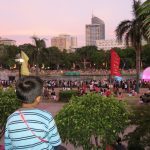 Which is an expensive hit to our ‘flashpacking’ around the world budget, but the tour was comprehensive. When booking we had to wait 5 days for the next available space, due to the popularity of this trip. Children under 11 years old can’t take the Panmunjeom tour, you can’t wear flip flops or short sleeves, and your camera lens can’t be larger than 90mm in diameter. 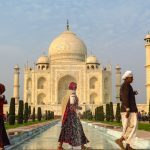 It’s worth pointing out that elements of this tour can be cancelled at a moments notice for security reasons, this is quite a common occurrence and we were lucky on the day we visited that we managed to gain access to all the sites on the full itinerary. 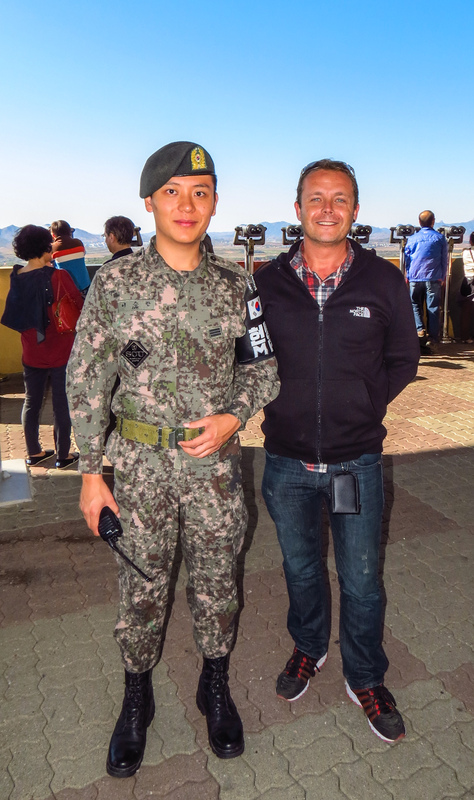 Only three days before our visit, it was reported by the BBC, that a North Korean soldier had defected to South Korea. 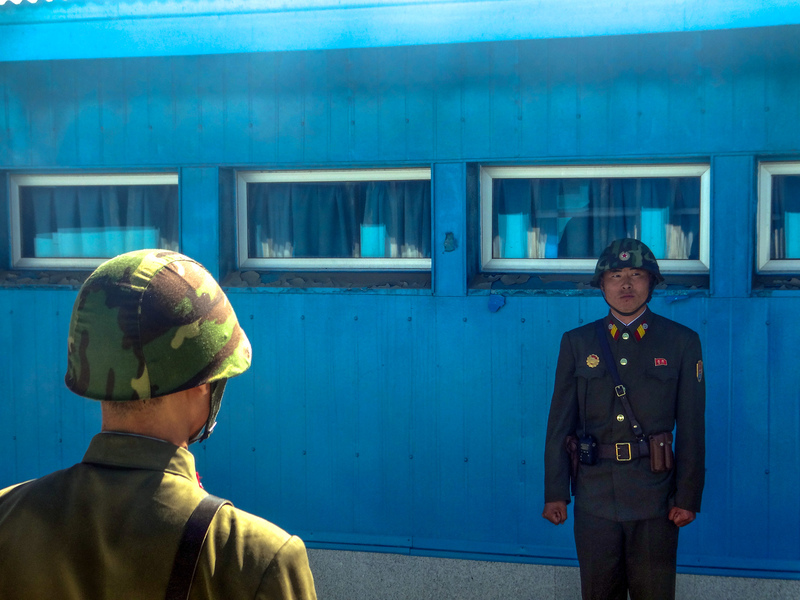 When fleeing North Korea, the soldier said he shot dead two North Korean officers. 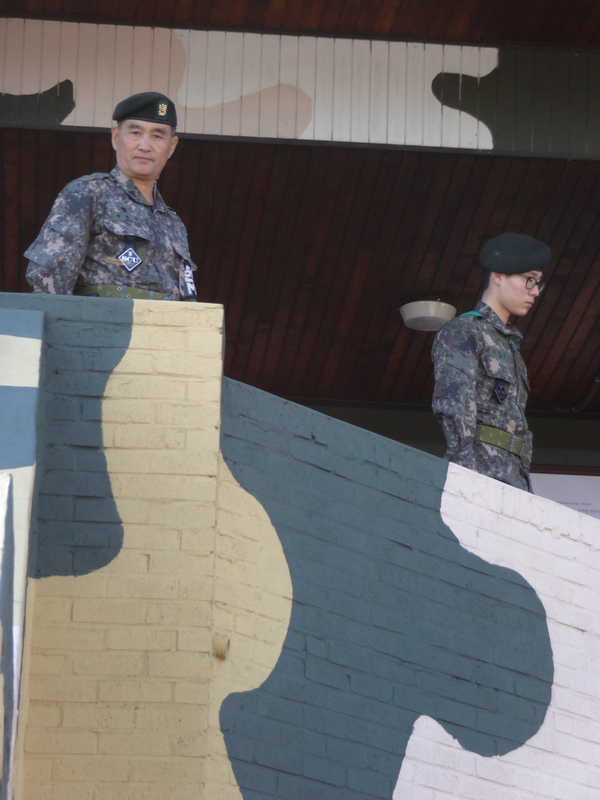 At the time of our visit the soldier was being ‘interviewed’ by South Korean intelligence to ensure his account is accurate and he is not a spy. Defections are no longer that common; I think the last by a soldier was in 2010. This is despite reported food shortages and probably more to do with increased defences in place by the North Korean government to stop this occurring. Despite this, more than 20,000 North Koreans have gone to the South in the last 60 years, mostly via China and SE Asia. The two countries are still technically at war after the 1950-53 conflict, which ended in a ceasefire not a peace treaty. 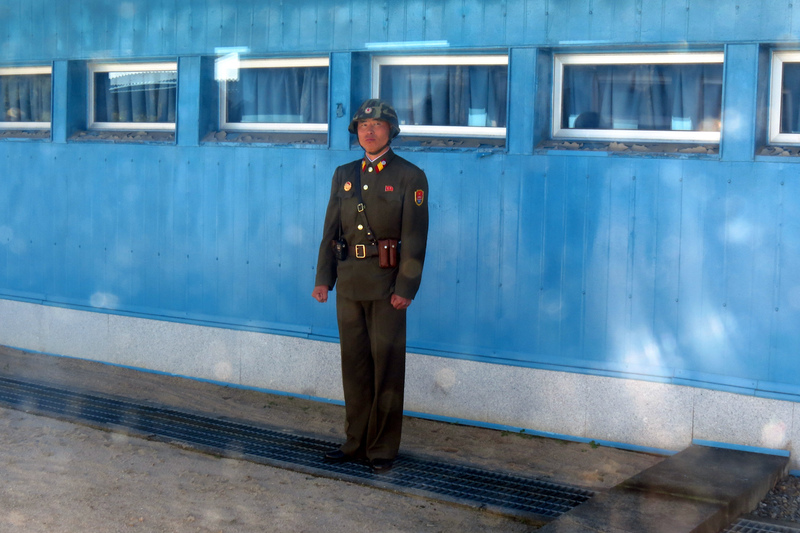 On the tour you enter restricted military areas, and the list of rules and regulations is long. You are understandably not allowed to take pictures in many locations, your mobile phone should be turned off, you shouldn’t point or wave at anybody, you shouldn’t try to talk to the soldiers, you need to walk in tightly formed single file (no running etc) and there are plenty of other things you need to adhere to. 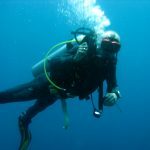 There is also a strict dress code which the tour operator informs you of at the time of booking. 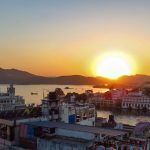 The rules are repeated regularly from the start of the tour and outlined in further detail in a briefing session which creates a climate of trepidation amongst the tour group. This is especially poignant when you have to sign a document to say that if you are injured or killed you have no recompense and that you waive your rights being aware of the risks. You need to carry your passports with you as they are checked regularly throughout the day by the army at different checkpoints. The tour starts at a city centre Seoul hotel where everybody boards the various buses departing for the day. Tour groups are separated on which tour itinerary they have chosen and which language they’ve opted to take the tour in. 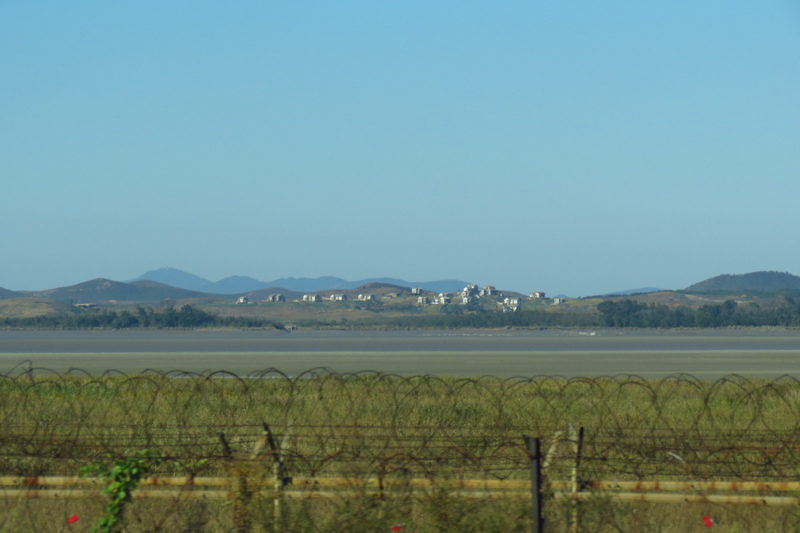 On leaving Seoul, before our arrival at The Demilitarized Zone (DMZ), we spotted our first glimpse of North Korea from the coach window. You are instantly struck by the stark difference in appearance from that of South Korea. The hills and mountains of South Korea are lush and green, in contrast to those across the border that appear barren and brown. Whether this deforestation has occurred through economic necessity or through military objectives, it does fill your heart with despair. 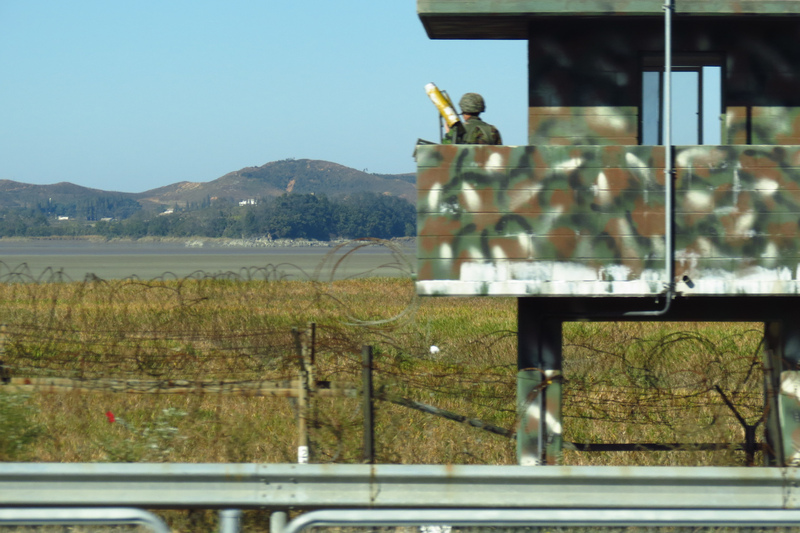 As do the watch towers, military fortifications and barbed wire along the Han River banks on both sides of the border. 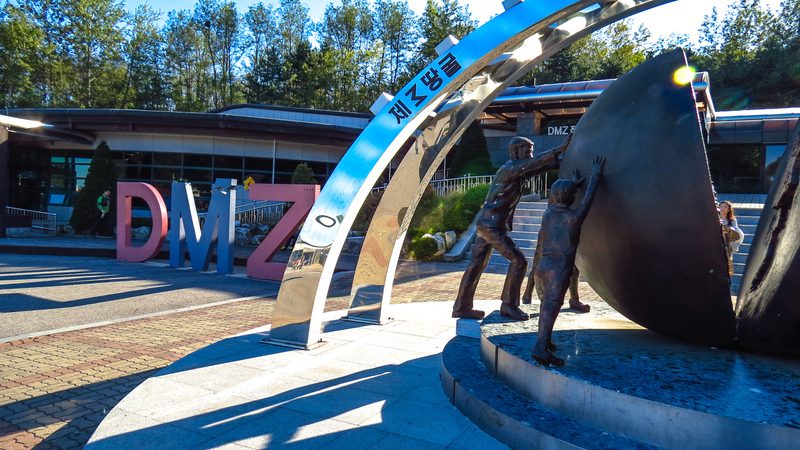 The DMZ is just over 150 miles wide across the Korean peninsula. The area of the 4,000 metre wide strip has been largely underdeveloped since the truce was signed. Despite the land-mines and military presence, this area includes some fertile agricultural land. 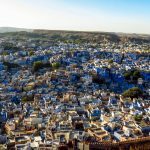 A limited number of civilians have been granted special permits to live and work inside this area, about 155 families, who have permission to farm the land. 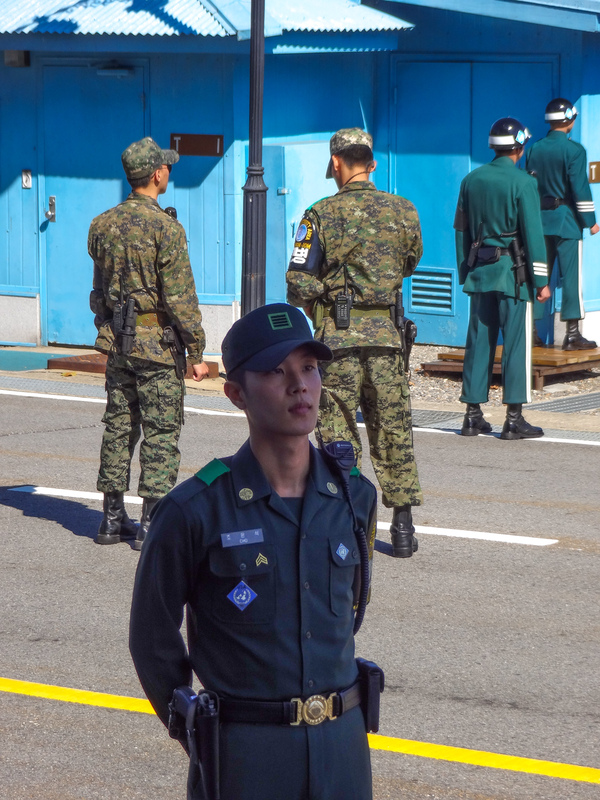 Due to the danger and risks, and inconveniences such as daily curfews, the South Korean government grants these workers certain benefits. One of these perks is receiving tax free status. Therefore, the GDP of people living here is the highest in Korea. 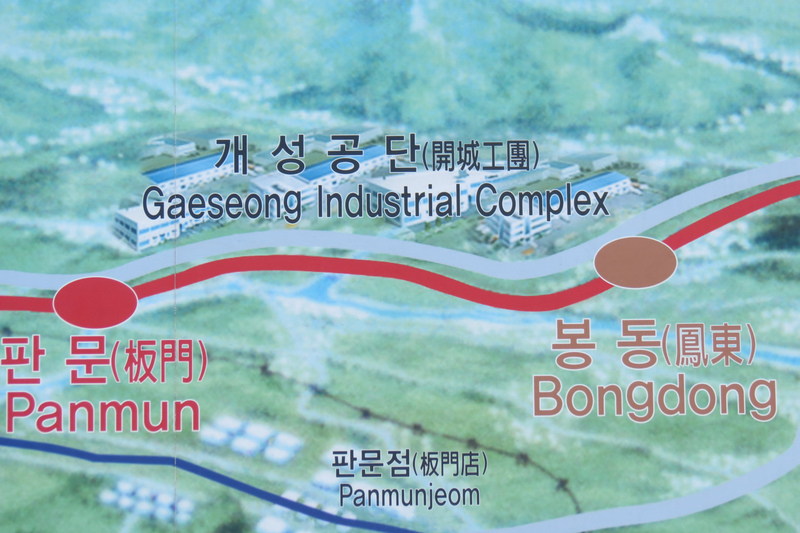 Amongst other things they farm Red Korean Ginseng which is an expensive and globally in demand product. The list is now closed and if you are not born into one of these families, or marry, you can’t get a permit – we did try! Since visiting Korea we’ve drank Ginseng on an almost daily basis. Whilst we can’t substantiate some of the claims associated with this product such as slowing the ageing process, improving memory and anti-cancer properties (and it would have to be a miracle drug the amount of cigarettes we’re both chomping through). We do feel it increases our stamina and gives our energy levels a boost, great for pounding those city streets. Apparently the best is the red label, 6 year old type. The tour starts at the Advance Camp which is controlled by the United Nations. 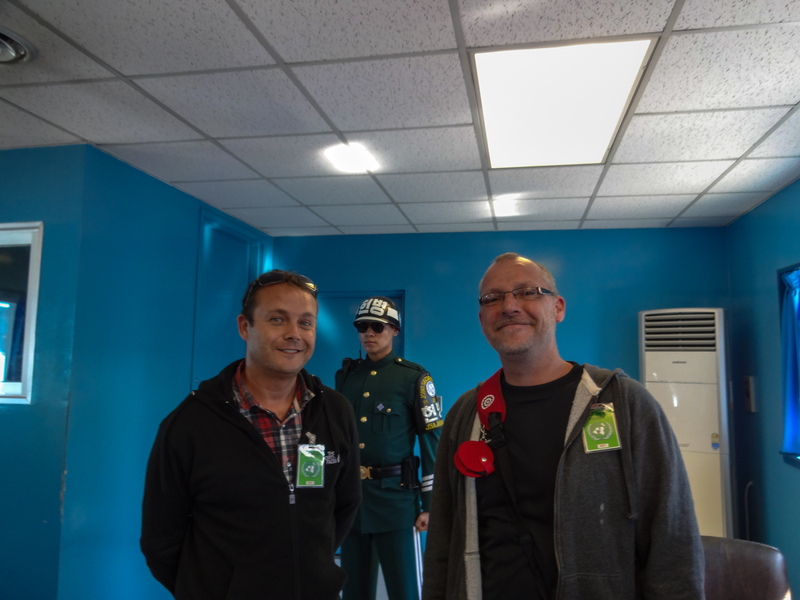 Inside the building we received another briefing session and learned a bit about the DMZ and the reasons for the United Nations presence in this area. The Advance Camp has a large souvenir shop, which sells all manner of wonderful and bizarre things ranging from children’s military wear to souvenir barb wire. The shop also sells cigarettes and other essentials for the soldiers at the base. We were then taken on a military bus which was driven and escorted by military personnel. 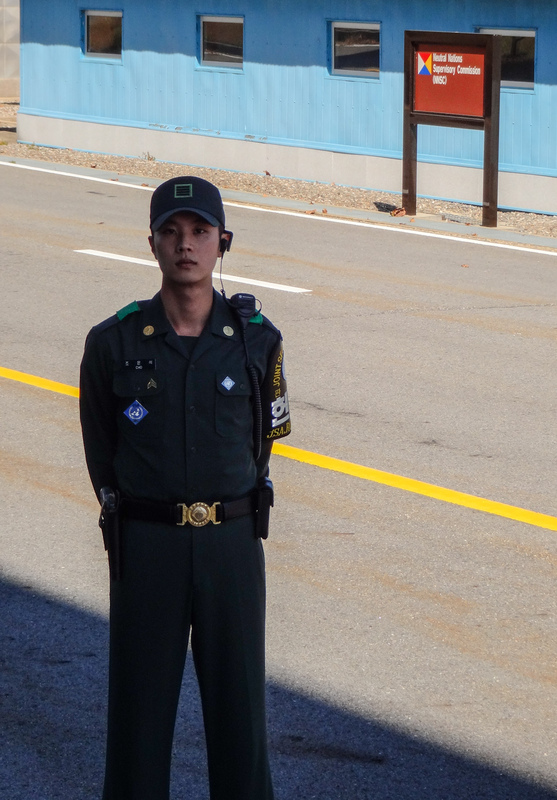 You aren’t allowed to stand or take pictures while being driven to the Joint Security Area (JSA). 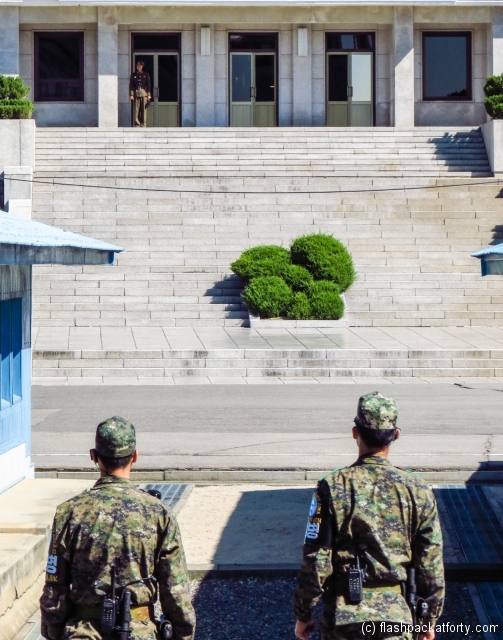 The JSA is separated in half and is the point at which you can see soldiers from the Korean People’s Army standing guard. 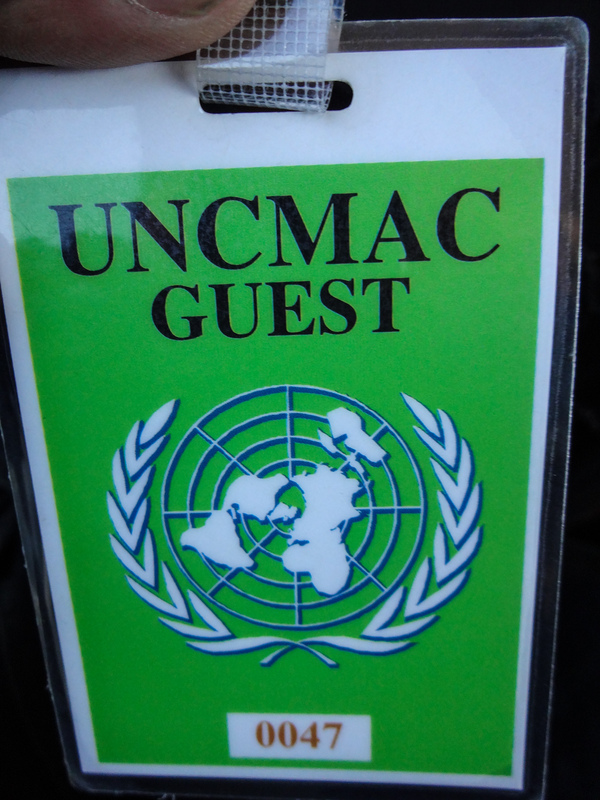 We went into the Main Conference Building here, which is under the control of the United Nations. 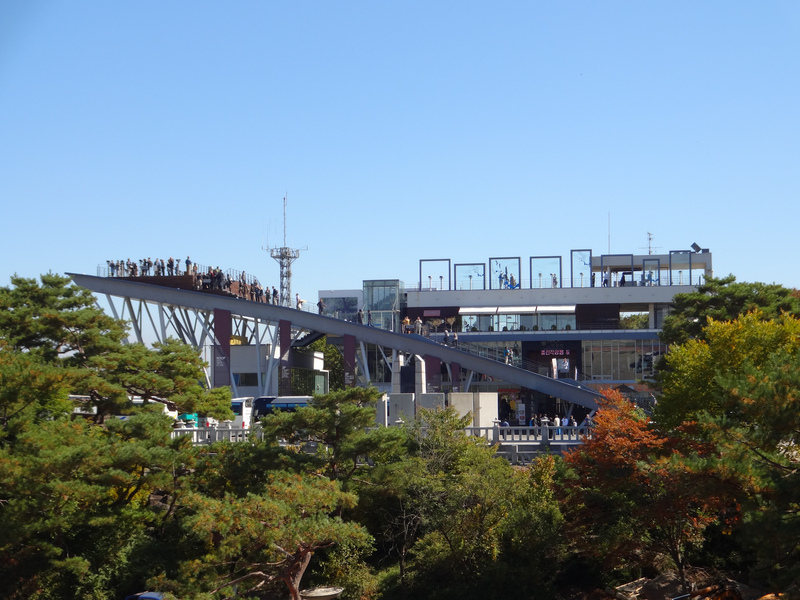 This is the only place in Panmunjeom where visitors from both sides can cross the Military Demarcation Line, so for a few minutes you could say we were in North Korea. 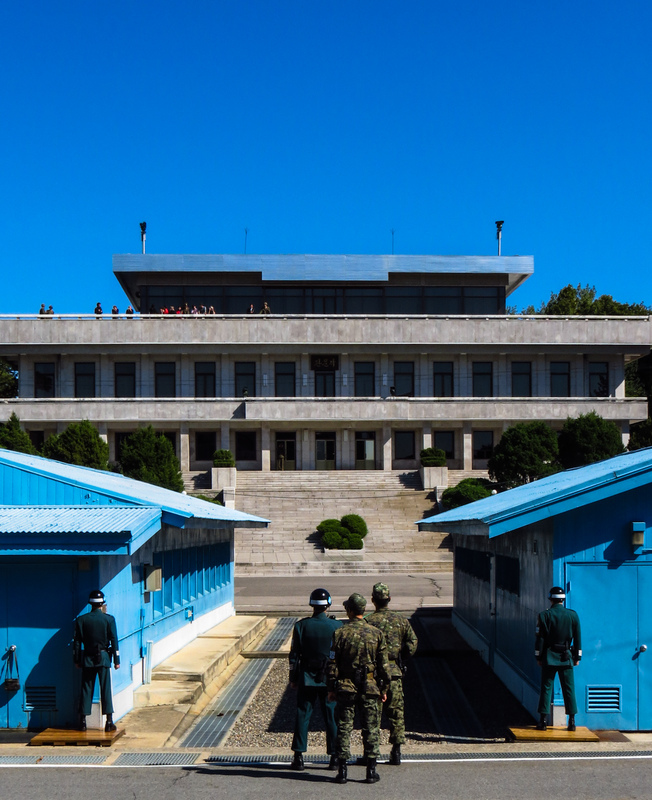 Panmugak of North Korea is the main building managed by the Korean Peoples Army and was built in 1969. It is within spitting distance of the main conference building. 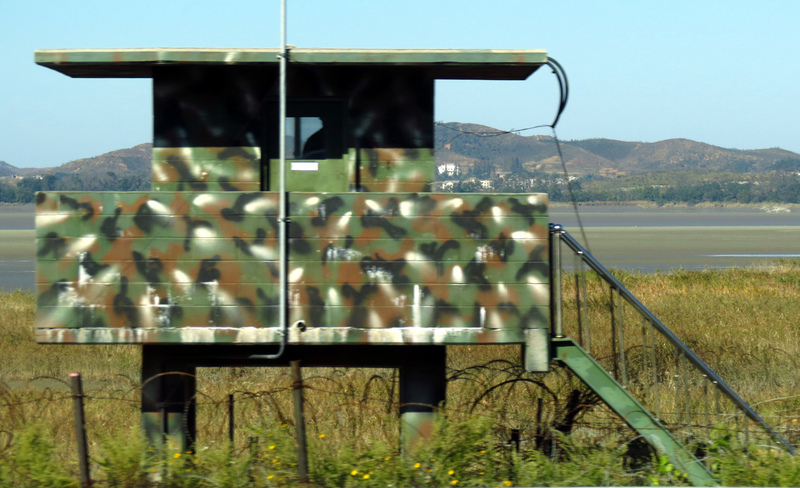 It is used as a command post of the North Korean Guard Force and has an observation tower for visitors who come from the North Korean side. We took a quick look at Freedom House which was originally built in 1965. A new building was added in 1998, it was supposed to be a meeting place for families that had been separated during the war. 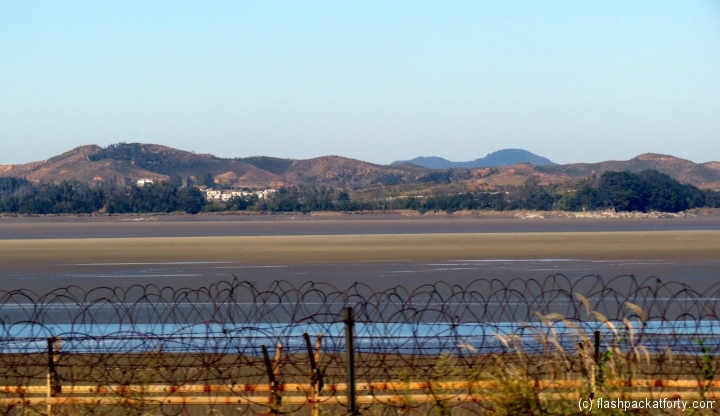 However, North Korea does not allow its citizens access to this facility so it has never fulfilled its purpose. Back on the bus you drive by two significant areas. 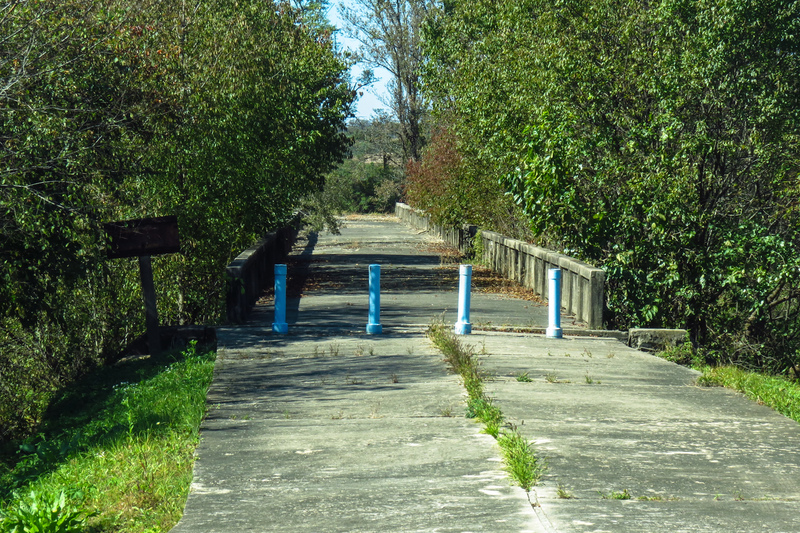 The ‘Bridge of No Return’ was the site for the exchange and repatriation of prisoners. Once a prisoner had crossed the bridge to the other side they could not return, hence the name of the bridge. 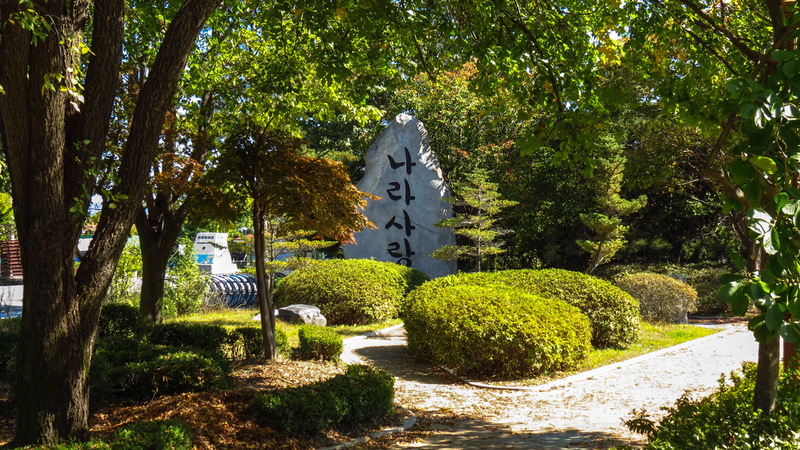 Another site is that of a tree cutting incident, you can still see the stump of the tree, which saw a major escalation of the tensions when in 1976 two US servicemen were killed by North Korean soldiers. The JSA camp is now named after one of the soldiers who died, Capt. Bonifas. 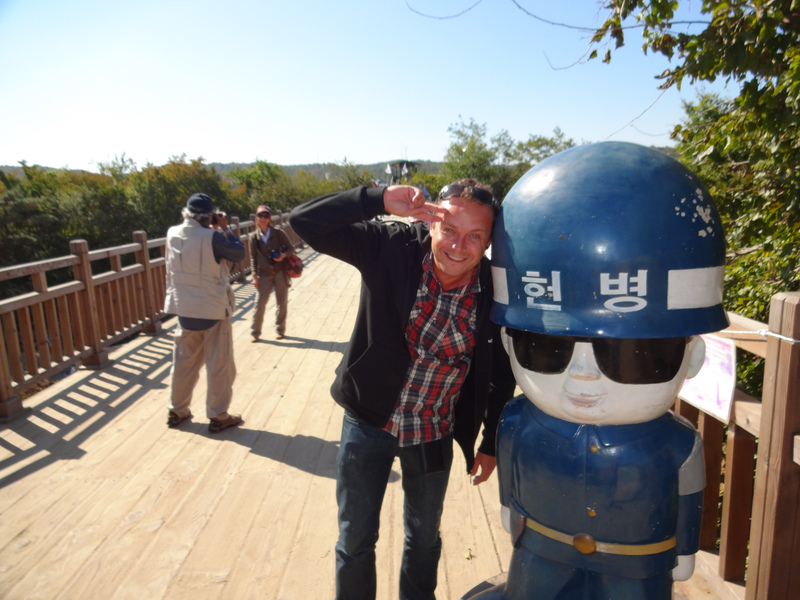 We then returned to our coach to continue exploring the DMZ and surrounding areas. 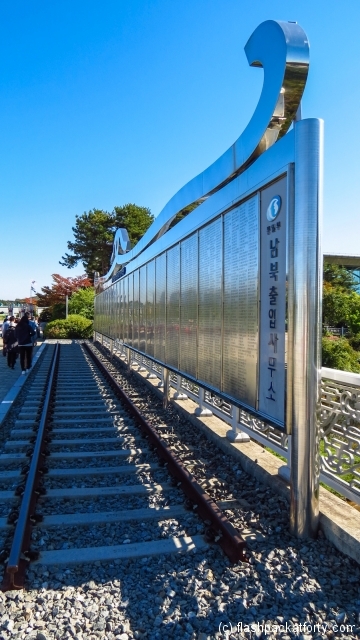 Many tour operators offer the DMZ tour as a tour on its own, with a slight variation in the itinerary at a cheaper rate. 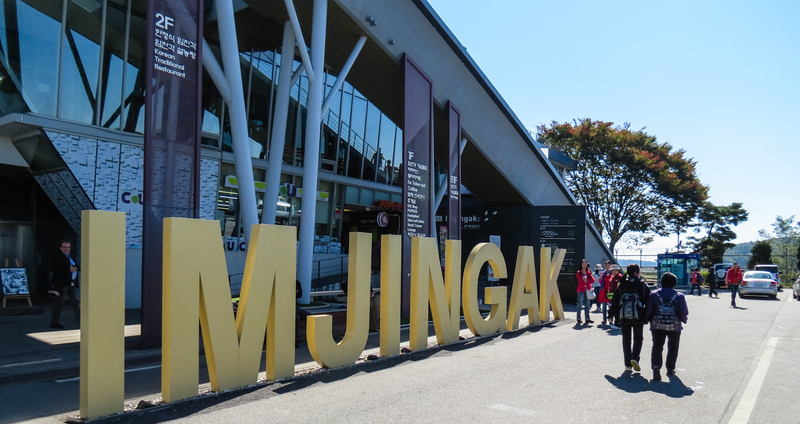 You start the tour in Imjingak, which is one of South Korea’s busiest tourist attractions with over 5 million visitors a year. 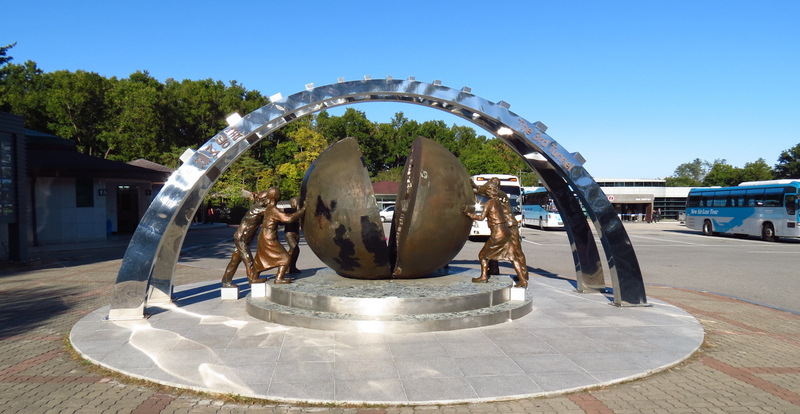 Imjingak covers a very large area, and there are many monuments and relics from the war. 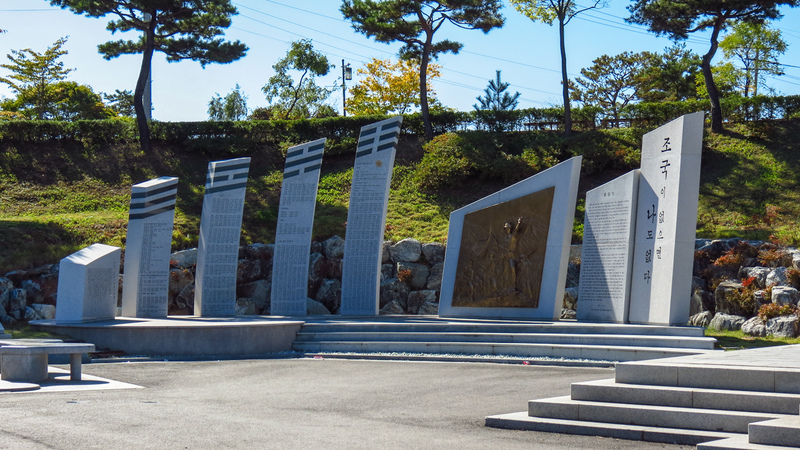 Many elements of the park portray the Korean people’s grief and desire for peace from the conflict through unification. 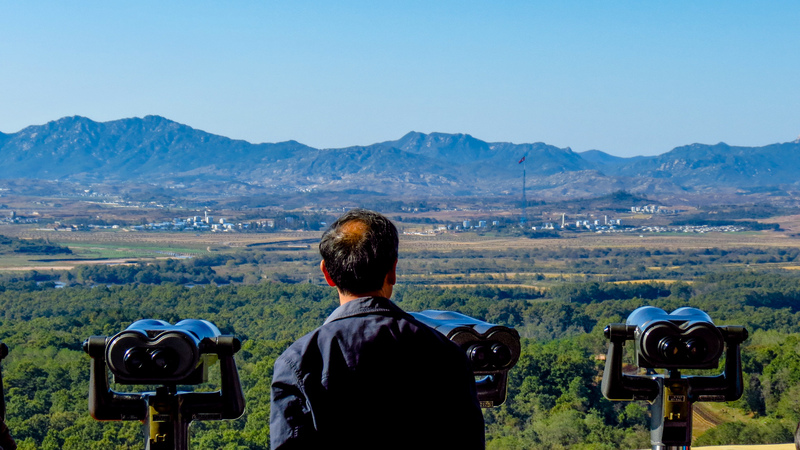 Of particular note is the massive observatory deck of the Imjingak where you can see North Korea, the surrounding Imjingang River and railroad. You can also walk along the Bridge of Freedom, which was constructed to free 12,773 prisoners in 1953. Today it is home to thousands of prayers placed on brightly coloured ribbons. 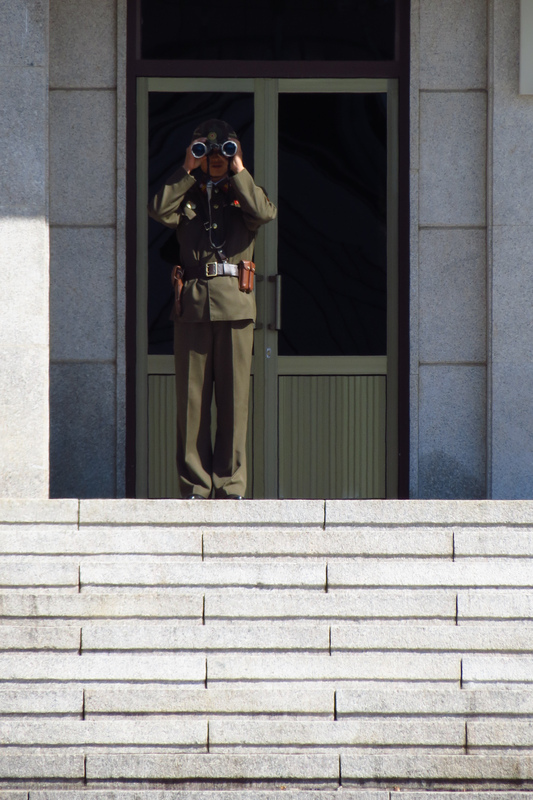 This won’t be the only place to view North Korea on the tour. 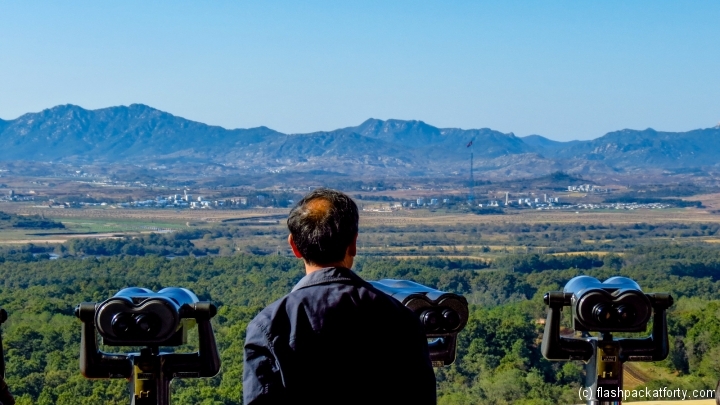 The most iconic and busiest is at the Dora Observatory, which is the northernmost observatory in South Korea. 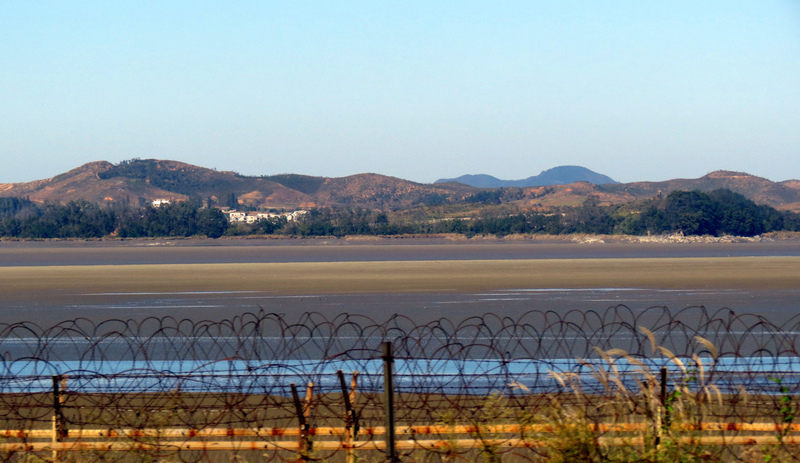 You can easily see North Korea from here and the ‘propaganda village’ there. The most eye-catching site is that of the North Korean flag. If only they’d sent some of the London Olympics staff here they wouldn’t have confused the flag of that with South Korea. 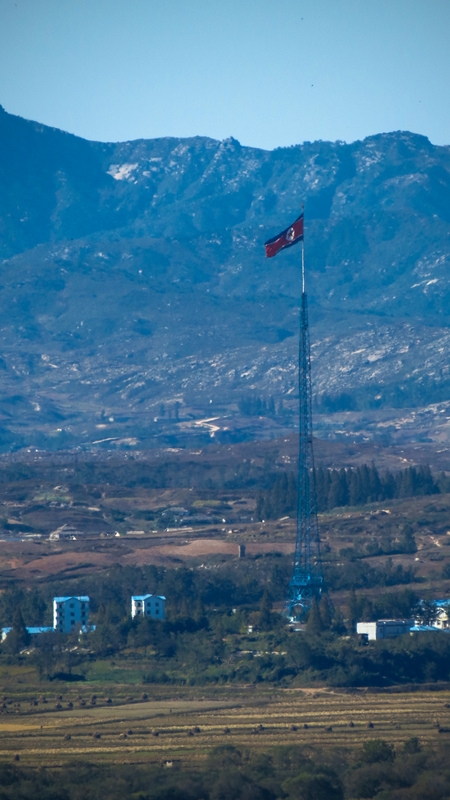 Their bigger flag pole was erected after the South Korean’s made their big flag pole. North Korea wasn’t to be out done and made theirs bigger and better, by a considerable amount, its huge. We also paid a visit to Dorasan Train Station, which has been visited by some of the world’s dignitaries, and ex-President Bush (Junior)! Again this place contains some strong symbolism for peace and unification. 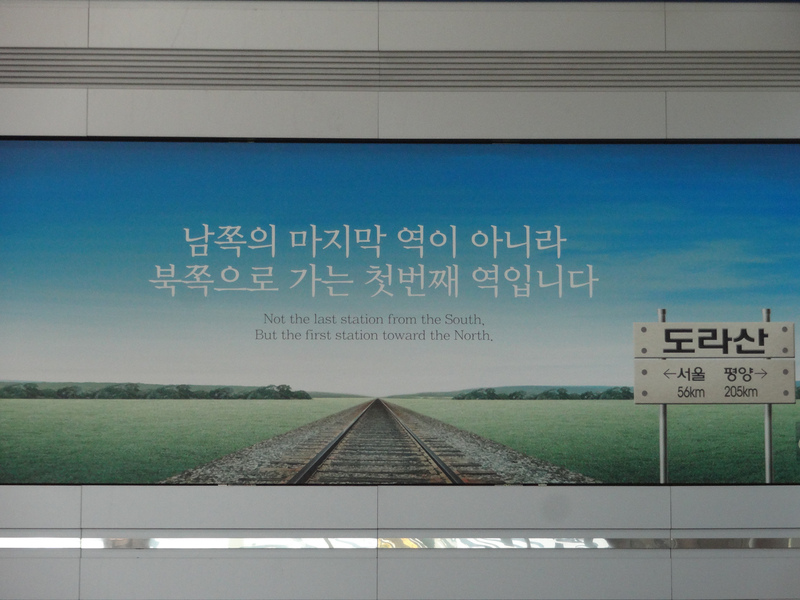 It is hoped that one day this state of the art station will connect the two countries and furthermore, Korea with the rest of Asia, Europe and beyond. Growing up I recall the news of discovering the tunnels dug by the North Koreans into South Korea, as a plan to invade. We were told, you could move an entire army division, plus weapons, through a tunnel in one hour. 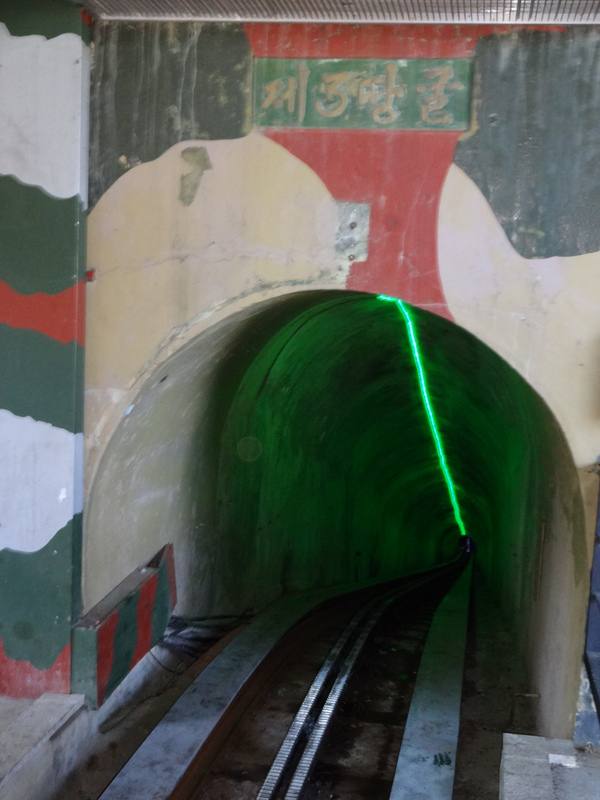 The 3rd Tunnel (of 4) that we visited is only an hour drive from Seoul. The North Koreans denied this. It is only thanks to a defector that the tunnels were discovered by the South Koreans in the 1970s. We had to descend and ascend from the 3rd Tunnel on foot as the monorail had broken down. This wasn’t so bad for us, but there were a number of very elderly people who had taken the train down before its mechanical failure, and had to make the steep ascent up. You could see they were painfully struggling, despite Koreans being some of the fittest people we’ve ever met. 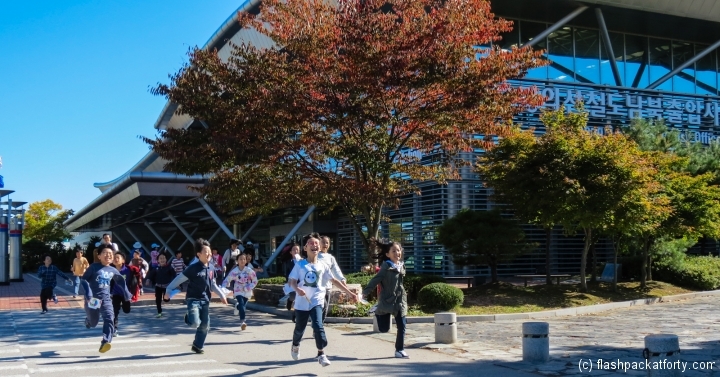 Was it worth doing the Panmunjeom tour? Yes, we both had a good and informative experience. Visiting the JSA you get to see firsthand some of the massive resources required to stop this war from escalating. I think if we’d just visited the DMZ we wouldn’t have appreciated the scale of operations, or seen in person the soldiers on both sides of the conflict. 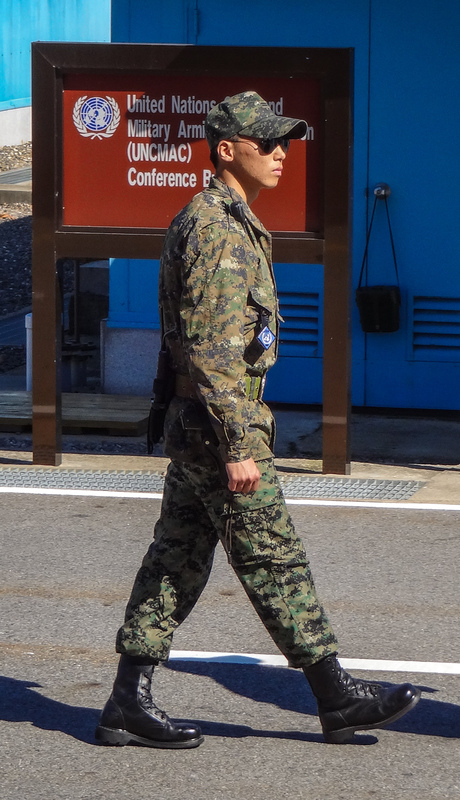 I think it’s worth saying that every Korean male serves in the military for at least 2 years of his life. 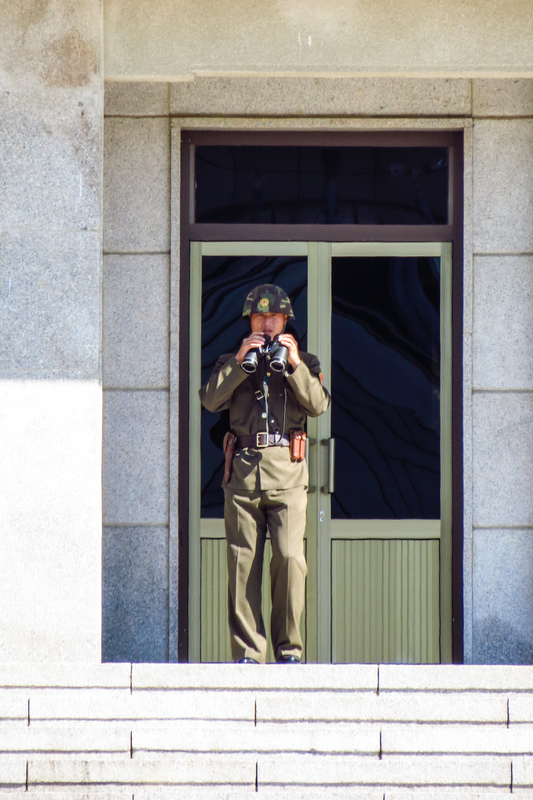 As this is a travel blog, and not a researched journalistic article about the Korean conflict, it is biased. 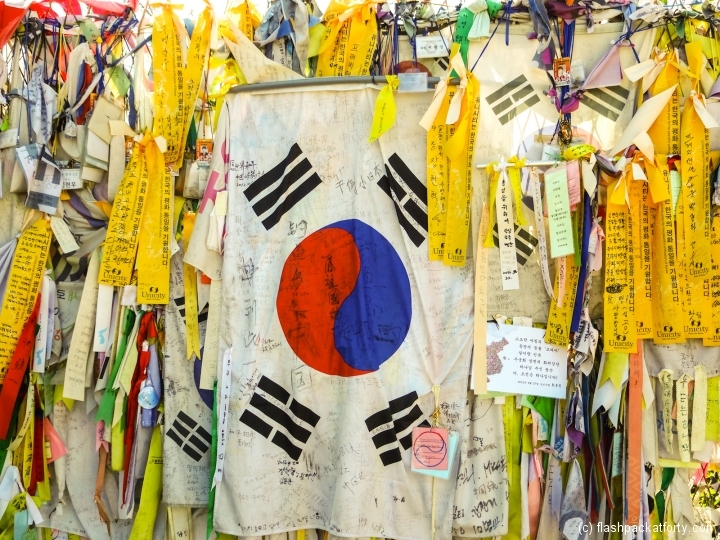 Our very limited impression from taking this tour is that South Koreans are compassionate towards the suffering of their North Korean brothers and sisters. 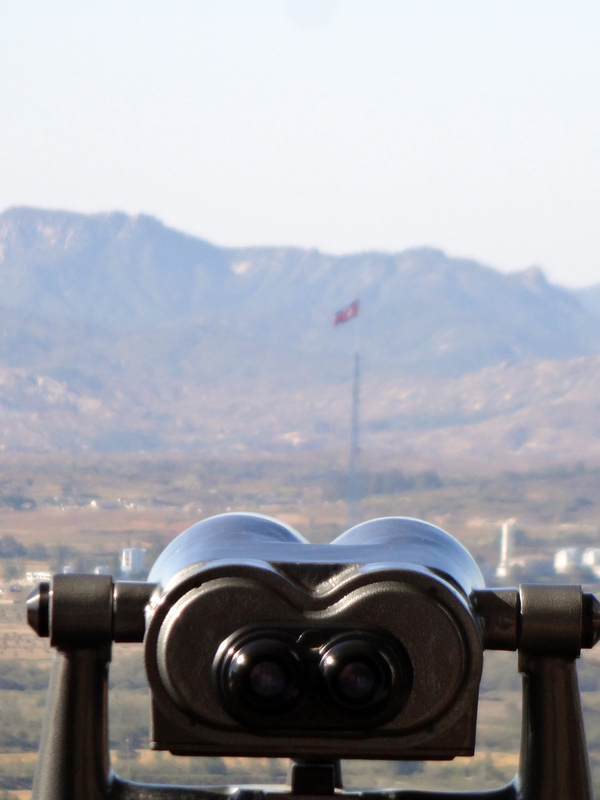 There are reports of food shortages throughout North Korea. 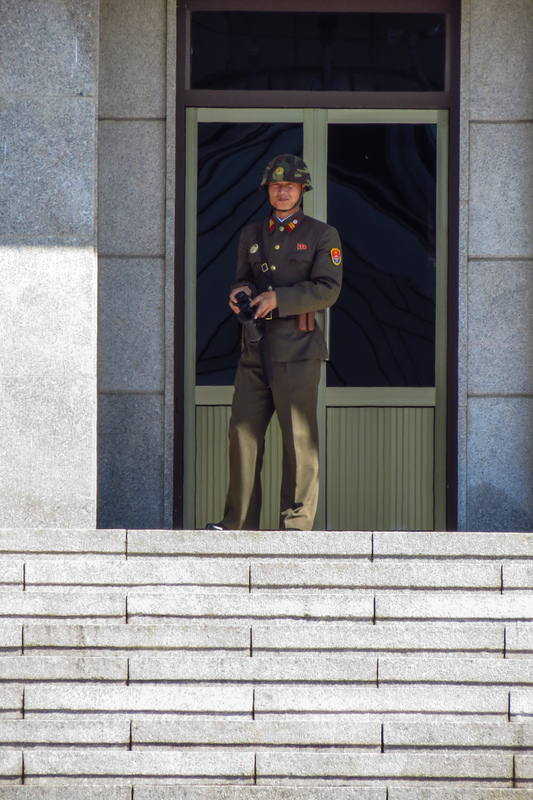 South Koreans are sad that most people living in North Korea don’t have the same civil liberties as they are afforded, such as the freedom to travel to other countries. The objective of South Korea is for a unified Korea where families can be reunited and people can peacefully prosper together. 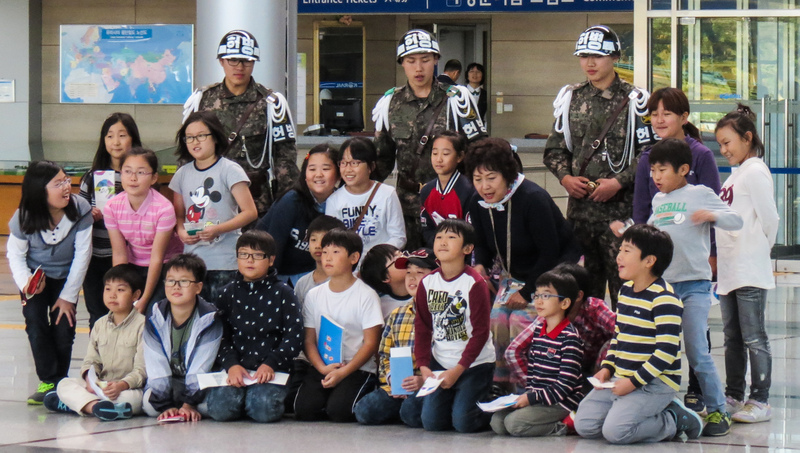 Many families were painfully separated on the formation of the two countries, and South Koreans still search and travel to meet relatives in North Korea, some for the first time since the conflict erupted. 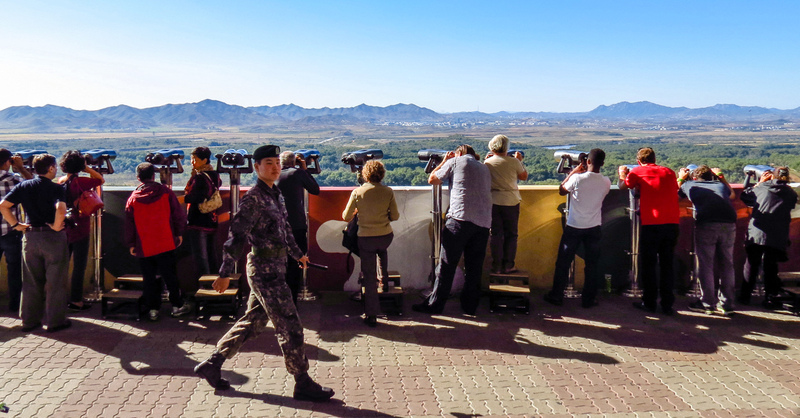 You can visit North Korea and take the tour from that side of the border; in fact we saw some tourists with cameras on the North Korean side. 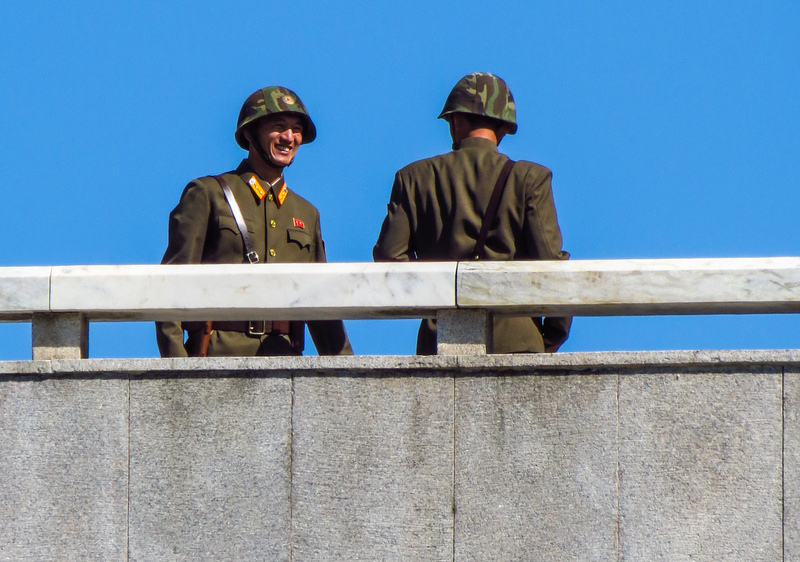 I understand that the cost of such a tour in North Korea is very expensive, has to be via an organised travel company (no doubt managed by the North Korean Military regime) and is something we would not be happy to do. Hopefully in the future there will be no need for this tour to exist, and a peaceful solution can be found to resolve this futile war. 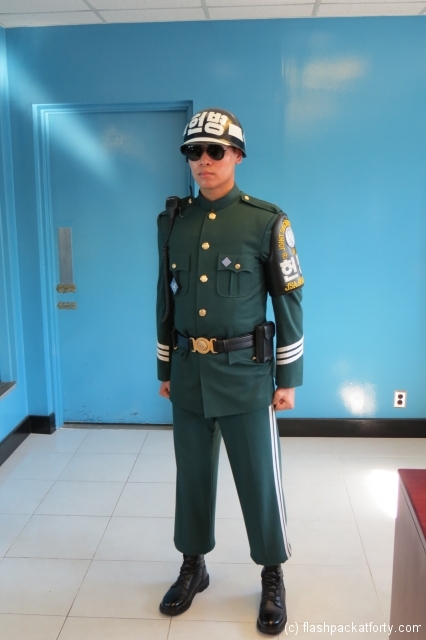 8 Comments on "Seoul Trips: DMZ Tour and Joint Security Area Itinerary"
Interesting post + great photos. 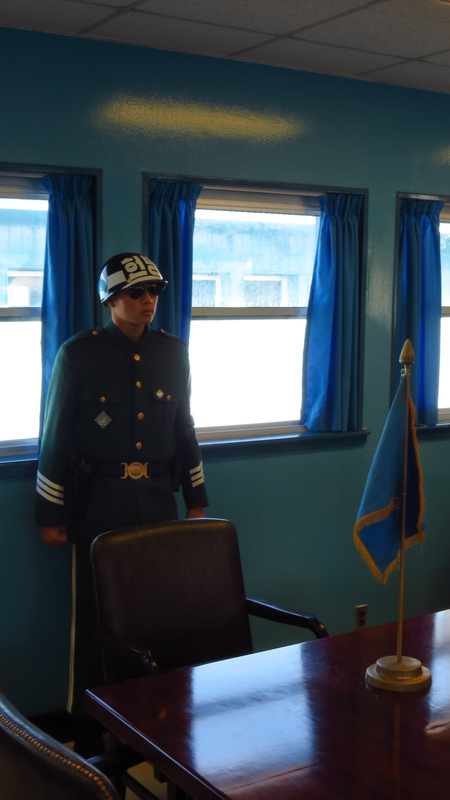 I recently visited the DMZ (Early October) from the north where I no doubt visited the same room on the border. 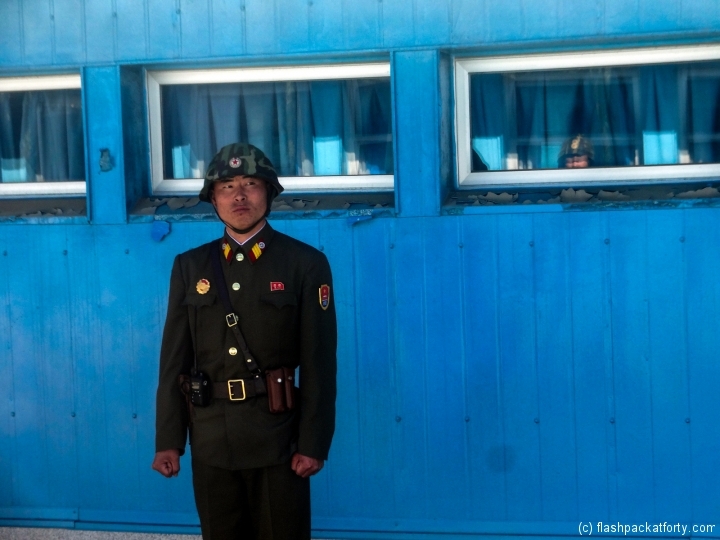 During my three day stay in the DPRK I also visited Pyongyang and a few surrounding villages. During my stay I didn’t see any examples of barren or brown it was really quite the opposite. Towards the DMZ the coach ride took around 2.5hrs and was without a doubt one of the most scenic journeys I have experienced. It could almost be a hikers /landscape photographers paradise if we were allowed off the coach. 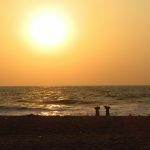 I love the blogs on South Korea. I think you have sparked an interest in me to visit, its sounds fascinating. I hope all you are both well. Korea is a real blast you would love it and the people would love you. Rice wine and sweet potato wine is to be enjoyed with the locals, for a very interesting evening out. That North Korean flag picture was could not have been taken from Odusan. It had to be taken from Dora Observatory. You can’t see it from Odusan. Well spotted, the text is correct, but the picture label is not. 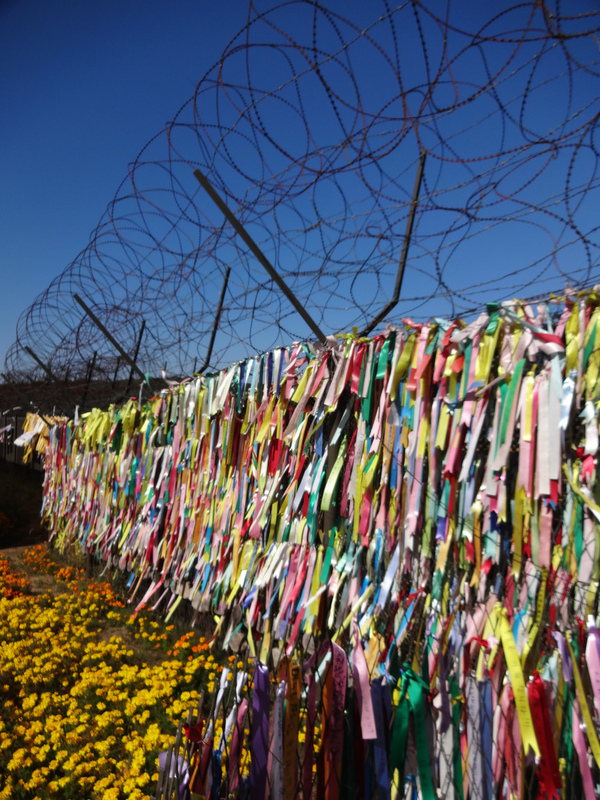 Great DMZ photos. 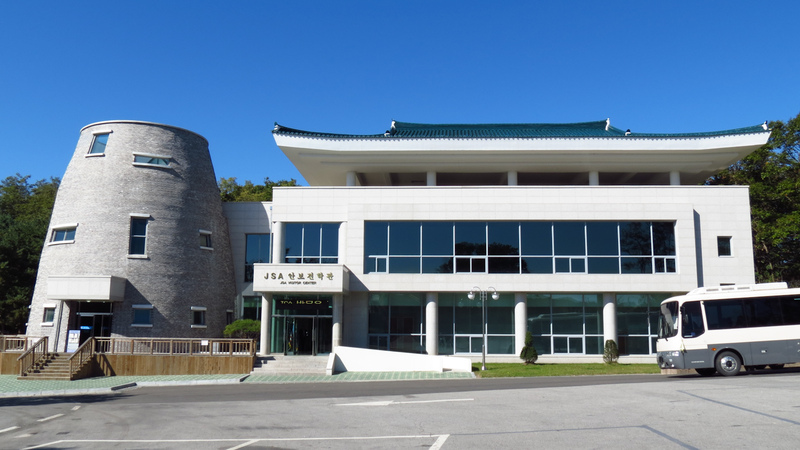 I visited JSA too back in November 2011. Just the JSA tour though. Just a quick question – Where were you guys when you took this pic – http://flashpackatforty.com/wp-content/gallery/cache/3914_watermark_720x640_north-korean-guard-dmz.jpg? Inside conference room right? 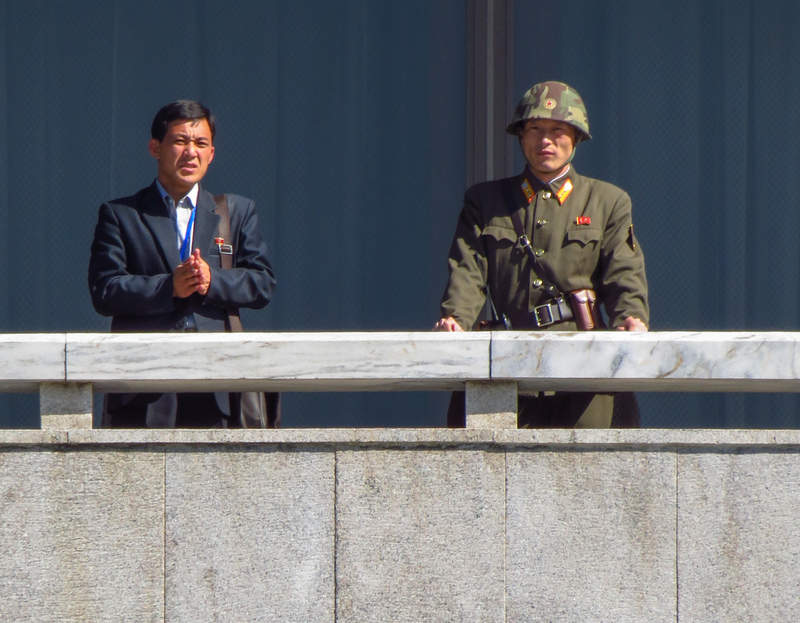 When we visited JSA there were no DPRK soldiers around the conference house. We saw some in Panmungak. Thanks for your comments, We were lucky just as we arrived the DPRK soldiers were at the side of the conference room and we snapped this through a rather dirty window. Looks like these tours may be cancelled given the situation there at the moment, shame.